These modules will be shared by all partners and adapted to their context. In a later step, more specialized modules will be developed to explore more specific challenges in the areas of schools and youth care. These modules will also be more tailored to the specific contexts of the partners. In the next three months, the partners will now build sub-groups for the development of curricula, didactic guidelines, course plans, and course material for the six modules named above. 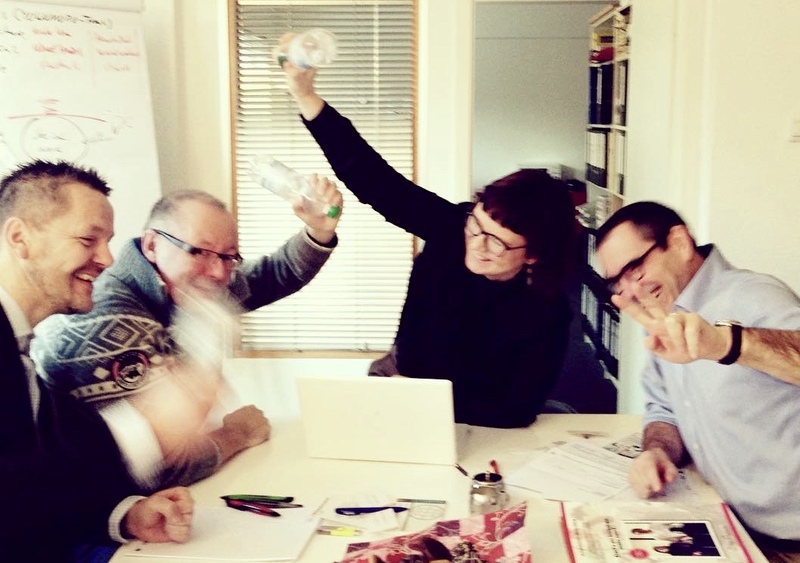 In addition to fleshing out the trainings to be developed, the interviews and focus groups also showed that the appraisals of the partnership – in particular, that there is a high demand for the YOWOMO2.0-competences in youth work – were confirmed. Throughout the talks with the stakeholders, a strong interest and a high willingness to collaborate could be found. The results of the YOWOMO2.0 partnership are now listet on the German Education Server (Deutscher Bildungsserver). The German Education Server (Eduserver) is the central Internet guide to the education system in Germany. As a web portal that is jointly funded by the federal government (Bund) and the federal states (Länder), it offers high-quality, edited information services to education professionals from various fields and the general public. The core idea of “Youth Work Mobile 2.0 – Train (YOWOMO2.0-Train)” is to get youth work in shape for the 21st century. Main target group are both youth workers and their trainers. Education and training for both will be devel oped to acquire competence and make use of up to date digital technology. This will enable professional youth work to become a player in the digitalisation of Europe increasing digital inclusion, community cohesion, digital citizenship, youth participation, while decreasing informational poverty among young people. YOWOMO2.0-Train builds on the results of the European research projects “EU Kids Online” and “Net Children Go Mobile”. Their results indicate that both the training of youth workers and their professional practice are challenged by the growing significance of smartphones and social media in young people’s lives. Internet use is increasingly mobile with more children accessing the internet in the privacy of their bedroom and when out and about. Although children do more online, most do still not climb far up “the ladder of opportunities”. The knowledge, skills and attitudes needed for professional youth work facing these challenges are described in the Youth Work Mobile 2.0 (YOWOMO2.0) competence framework, which is the outcome of a former European partnership. Building on this framework YOWOMO2.0-Train will now be the first project to be sustainable and to implement the YOWOMO2.0-competences for youth work in the age of smartphones and social media in youth work education and training. Education and Training, and in Continuing Vocational Education and Training in various European contexts. Due to the diversity the recognition and accreditation of education and training will refer to established systems such ECTS and ECVET, but also will refer to link to non-formal/informal tools such as for example “The Council of Europe Youth Work Portfolio“. As YOWOMO2.0-Train is partly building on the results of the former YOWOMO2.0 partnership, there are partners from the former YOWOMO2.0 involved. However, also new partners are included to allow for new insights and diversity related to culture, social system and level of digitalization. A course for youth work in the age of smartphones and social media. This course will enable youth work trainees and professionals to acquire the competences for youth work in the age of smartphones and social media. Due to the diversity of both youth work practice and youth work education and training across Europe the instructional design of this course will reflect the contexts of the participating partners. This will be achieved by developing adaptations for on the one hand (1) trainees and students Higher Education, Vocational Education and Training), and on the other hand professionals after entry into working life (Continuing Vocational Education and Training) as (2) in-house training and (3) external course. An online learning platform and repository. The YOWOMO2.0-Train online platform will offer these courses in form of MOOCs and will serve as a repository of open educational resources for education and training. More than 4000 persons will benefit from the project being involved in stakeholder interviews, focus groups, pilots, multiplier events, or as users of the online platform. The project will impact local, regional, national and international stakeholders in seven countries (Germany, UK, Turkey, Romania, Poland, Italy, The Netherlands) stimulating improvements in youth work practice and in the education and training of youth workers by offering up-to-date education and training on different qualification levels (HE, VET, CVET). 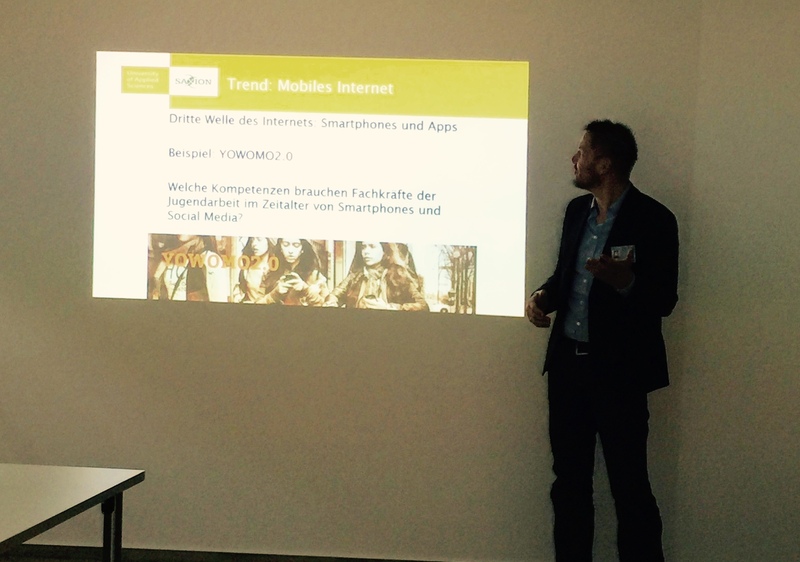 On 21st and 22nd of January 2016 representatives of the YOWOMO2.0-partnership met in Münster/Germany to prepare a YOWOMO2.0 follow-up project. Overall goal of the new project – working title YOWOMO2.0-train – is to sustainably implement the YOWOMO2.0 competence framework in education and training of youth work professionals. Therefore, the YOWOMO2.0 framework will be applied to three lines of education and training: 1. Higher education – this can for example be done by integrating the YOWOMO2.0 competence in social work study programmes; 2. Vocational education and training – here the education and training of for example youth work assistants can be addressed; and Continuing education and training – this could be achieved for example by developing and offering in- house trainings for youth work professionals after entry into working life. YOWOMO2.0-train is expected to be run as a strategic partnership within the European Erasmus+ programme. The meeting showed fruitful discussions, put the ideas into concrete terms and ended with agreements on how to further prepare the application for the project. 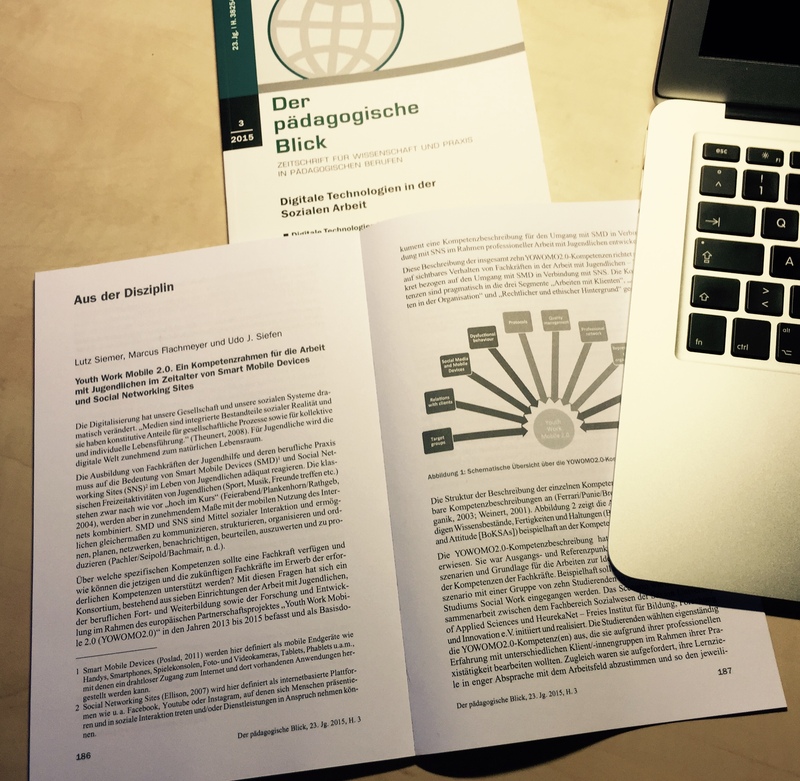 „Der Pädagogische Bick“ – a German peer-reviewed journal on science and practice in pedagogical professions – released an issue on „Digitale Technologien in der Sozialen Arbeit” (Digital technologies in Social Work). The section „Aus der Disziplin” (From the discipline) offers an article about YOWOMO2.0 by Lutz Siemer, Marcus Flachmeyer, and Udo J. Siefen. The article titled “Youth Work Mobile 2.0. Ein Kompetenzrahmen für die Arbeit mit Jugendlichen im Zeitalter von Smart Mobile Devices und Social Networking Sites“ (Youth Work Mobile 2.0. A competence framework for youth work in the age of smart mobile device and social networking sites) gives insight in the background, the results, and the practical experience of YOWOMO2.0. 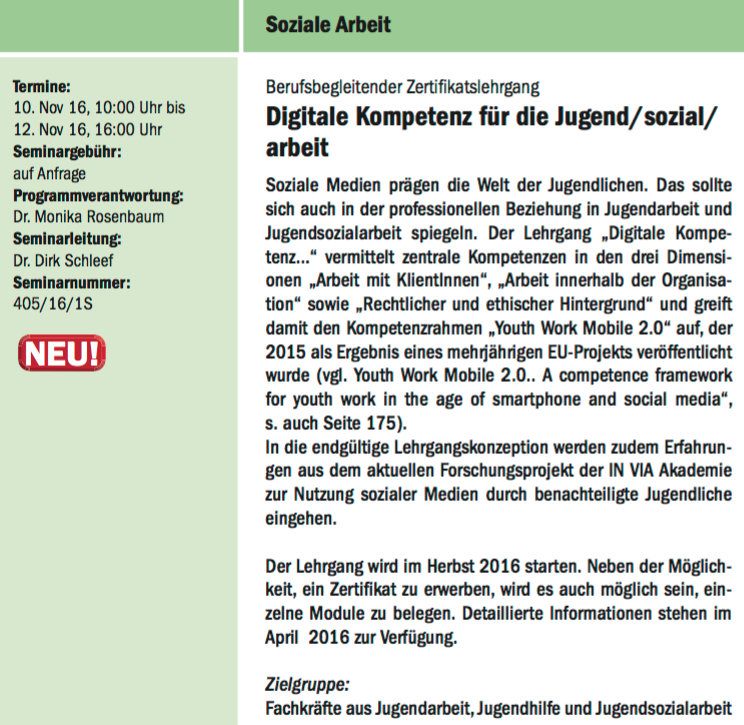 In addition the issue of „Der pädagogische Blick“ offers article about the necessity of a technology-related reflexivity related to digital technologies in Social Work, about challenges and opportunities for Social Workers and Social Work Education, and about youth work in Social Online networks. Lutz Siemer, Marcus Flachmeyer and Udo J. Siefen are affiliated with both HeurekaNet – Freies Institut für Bildung, Forschung und Innovation e.V./Germany and Saxion University of Applied Sciences/The Netherlands. „Appetit auf mehr“ (APPetite for more) was the title of a symposium organised by students and lecturers of the School of Social Work at Saxion University of Applied Sciences/The Netherlands. The symposium, that took place at the 20th of January 2016, explored innovative possibilities to participate for people with handicap by making use of modern media. Lutz Siemer, who is both affiliated with Saxion’s Technology, Health & Care Lectorate and HeurekaNet – Free Institute for Education, Research and Innovation, gave an oral presentation on “Social Work in the age of digitalisation”, where he named YOWOMO2.0 as an example for an innovative project addressing the increasing significance of smartphones and social media in internet based social work. IN VIA Akademie – a German academy for both research in social science and vocational education and training – will make use of the YOWOMO2.0 results in their future research and training activities. 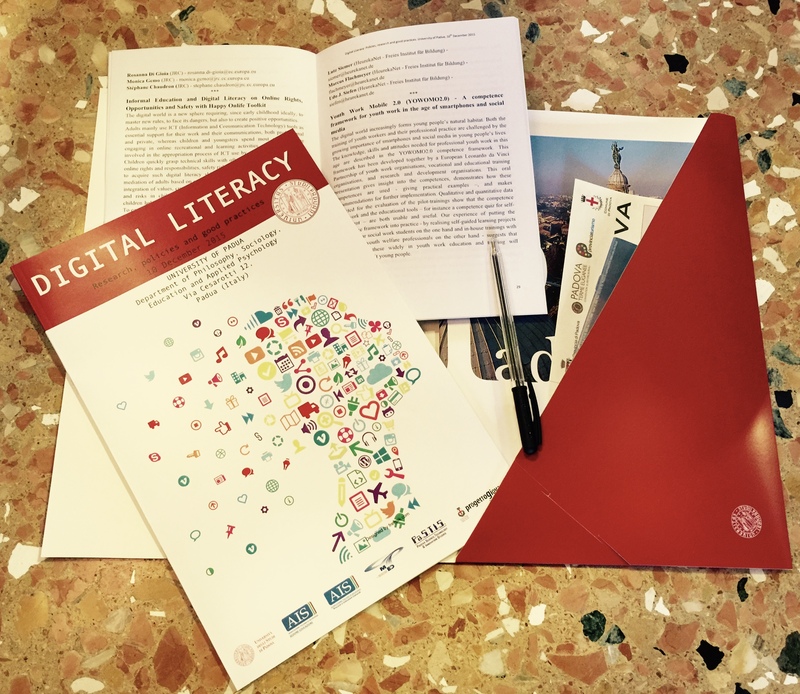 In 2016 IN VIA will offer a course for youth work professionals in which digital competencies for youth work and youth care will be acquired. The course content will build on research done by IN VIA Akademie as well as results of the YOWOMO2.0 partnership. Participants will be able to sign in for the whole course – which will include a certification – or just follow certain modules. 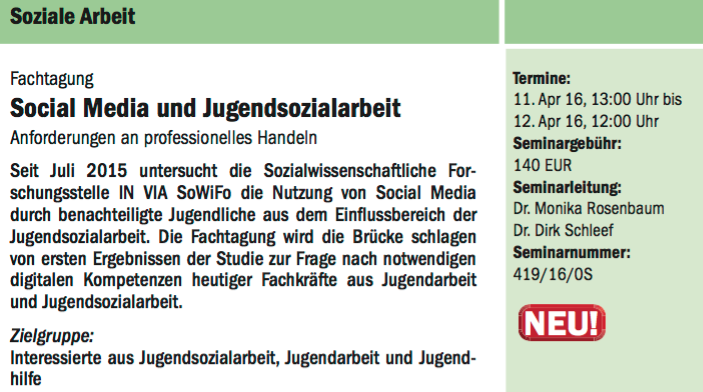 In april 2016 IN VIA Akadmie will also host a conference to discuss how social work is changed by the rise of digital technologies such as social media. Current reserach conducted by IN VIA Akamie explores how social media is used by youth services users, how they try to solve problems using social media, and if these attempts are successful. The results of the study will be discussed at the conference focusing on the question which competences youth workers should have. The results of the IN VIA study will therefore also be compared with the results of YOWOMO2.0. Results of the conference will also be used for the course named above.